Sometimes, truth can be every bit as strange as fiction and fiction can sound like the truth. The challenge of Urban Myth is to differentiate between fact and modern folklore - between what you thought you knew and what you have heard as gospel truth from a trusted friend. 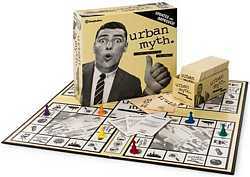 A completely unique game, Urban Myth will test your pop-culture savvy and provide excitement and surprises for groups of two or more players.